With Same Day Shipping* from BuyCostumes.com. Who do you want to be this Halloween? Exciting party games and party ideas for KIDS! 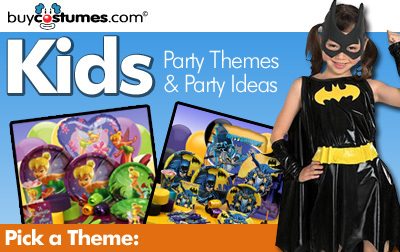 Give kids the time of their life with some new party ideas from the company who knows how to party. Rest assured these party themes and games will add to the fun. Remember, you can add additional guests a la carte at BuyCostumes.com. When I grow up... - Let kids come to the party dressed in the uniform of what they want to be when they grow up. Obstacle Course - Arrange two teams that compete against each other in a homemade obstacle course. Hayride - Look up local farms for hayrides or hiking on haunted trails. Have guests dress up as their favorite farm animal. Crafts - Have kids create their own treat bags to bring home after the party. Tye Dye - Let kids tye dye their very own shirt, shorts, socks, or towel. Scavenger Hunt - Put together a list of odds and ends for kids to go out and find from the neighbors. The pair with most items found, wins! Back to the 80's - Have kids dress in clothes from the 80's... where mullets were allowed! Costume Parade - Prance around in your costume while the judges take a look. Award 1st, 2nd and 3rd prize. Bob for Apples - Easy to prepare, just dump apples in bin of luke warm water. Let the fun begin! Pumpkin Carving Contest - Have guests bring their own pumpkin and provide designs and be sure to help kids with the carving. Dr. Jeckel's Lab - Provide a laboratory of objects in concealed containers and let kids reach inside. i.e. Eyeballs that are really peeled grapes! Mummy Wrap - Each team wraps another in toilet paper to create the best mummy. Or, let kids wrap the real "mummy," the host of the party. Coloring Contest - Make copies of coloring pages and award prizes for staying in the lines. Beauty Salon - Hire your babysitter to attend your child's party and do hair and makeup as if in a beauty salon. Face Painting - Have a clown arrive with face paints and temporary tattoos! Movie Night - Pop popcorn, serve refreshments and play movies all night long. Compliment the party with PIZZA! Dance Party - Let kids compete in a dance off. Turn your party go-ers into little disco divas! Party Favor Kits - Coordinate with each and every theme. Costumes - Don't forget to dress the guest of honor. Baby's First Birthday Supplies - Where did all that time go? Make it "one" to remember! Little Einstein Party - Perfect for the little genius in your life. 1st Birthday Princess Party Kit - Your little princess will be the belle of her birthday ball! Littlest Pet Shop - Gather all your animal friends for the pet shop party! Hello Kitty - A purr-fect party for your Hello Kitty girl! SpongeBob Sqaurepants - Create a pineapple under the sea and invite SpongeBob for your next party. Disney Princess Party Kits - Join Snow White, Jasmine, Ariel and many more for an enchanting day with Disney's Princesses! Under Construction Party Kit - Build awesome memories when you invite this favorite. My Little Pony Party Kit - Have a Ponyland party for the whole gang! Sweet Pea Baby Shower Party Kit - Celebrate the coming of your sweet pea! Sesame Street 1st Birthday Party Kit - A birthday to remember when the Sesame Street characters are your guests of honor. Also available, Sesame Street Party Supplies. Scooby Doo - A party filled with Scooby snacks! Harry Potter Party Supplies - A favorite for all ages; join Harry Potter and his gang for a wizard good time. Camo Party Kit - An awesome party for your little soldiers. Minnie Mouse Party Kit - Have Minnie Mouse join your family and friends for a special birthday. For when it's okay to act like a bunch of monkeys! red carpet for your future Hollywood stars. Nighty Night BaZooples Baby Shower Party Kit - Get ready for an animal filled adventure! Aloha 16 Party Kit - Celebrate your Sweet 16 on a tropical island Aloha style! Pooh's First Birthday Party Kit - Add some Pooh-sonality to that important first birthday party. NASCAR Party Supplies - Racing fans of all ages...start your engines! Clearance Costumes Limited quantities so shop today. Product Videos - watch before you buy! *Most domestic orders placed before 4:00PM (CDT) Monday-Friday will usually ship out the same day.